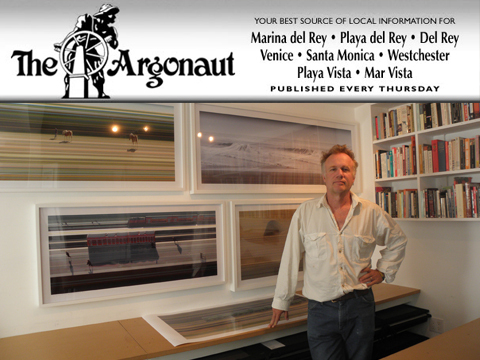 SUNDAY MAY 23, 11:30 – 4:30, THE ARTIST WILL BE EXHIBITING AT MULTIPLE LOCATIONS ALONG ABBOT KINNEY BLVD. Venice Family Clinic presents a selection of large scale photographic timeline art works by Jay Mark Johnson including new Compressed Time Waves photographs, Venice Boardwalk images not previously exhibited, works from his 2009 SPACETIME exhibition at ACE Gallery Beverly Hills and recent acquisitions by Frederick R. Weisman Art Foundation . . .
VENICE FAMILY CLINIC | A list of ALL VENUES here. | PRESS RELEASE here. | POSTER here. 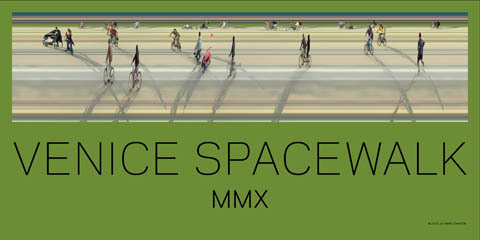 Boardwalk images not previously exhibited, works from his 2009 SPACETIME exhibition at ACE Gallery Beverly Hills and recent acquisitions by Frederick R. Weisman Art Foundation. 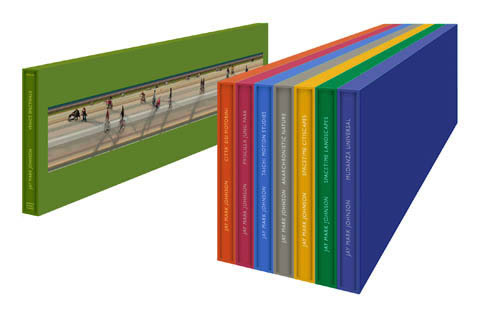 SPACETIME: Beyond the Constraints of Perception is a new book series that considers the photographic timelines of Jay Mark Johnson as a focal point for presenting a vibrant conversation on the nature of perception and its relationship to contemporary understandings of space and time. Recent developments in the cognitive and behavioral disciplines have shifted our understanding of how we perceive and represent the world around us. Increasingly, both innate and acquired capabilities . 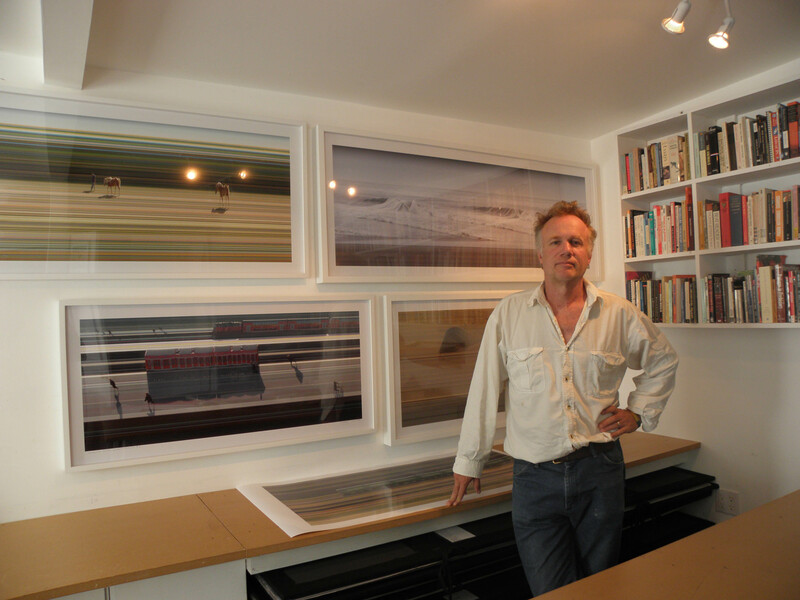 . .
is a new book series that considers the photographic timelines of Jay Mark Johnson as a focal point for presenting a vibrant conversation on the nature of perception and its relationship to contemporary understandings of space and time. Since opening in 1970, the Venice Family Clinic has become the largest free clinic in the country. Today, comprehensive primary health care and supportive services at seven locations in Los Angeles County are provided to over 24,400 low-income, uninsured and homeless individuals. More than ever, clinic officials say it is necessary to treat additional patients and they are always looking for ways to expand services, reach more people in need and stretch resources even further. 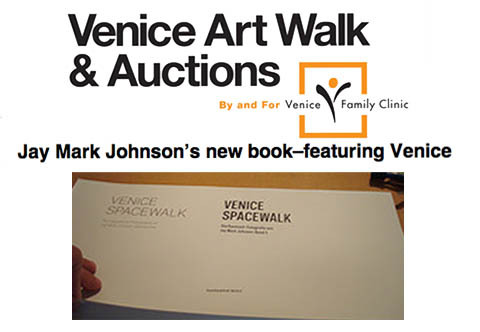 The Venice Art Walk & Auctions is the clinic’s largest annual fundraiser, attracting more than 4,000 art lovers each year . . . THE ARGONAUT | Read Betsy Goldman’s full article here. Actor/activist Adrian Grenier and film producer Peter Glatzer are proud to announce the opening of the SHFT GALLERY and Pop-Up SHOP in Downtown Los Angeles. The shop and gallery, curated by SHFT and Edie Kahula Pereira . . .
FLAVORPILL | SHFT.COM | Link to article here. Jay Mark Johnson, spacetime photographer extraordinaire, has a new book (the first of a series of 9). This time, he takes the eye on a journey through familiar and unfamiliar Venice. 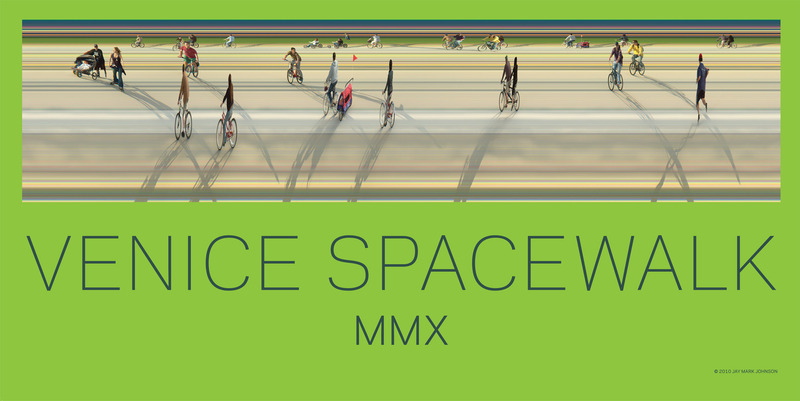 Hot off the press, Venice Spacewalk is debuting at the Venice Art Walk & Auctions . . .
VENICE FAMILY CLINIC | Read posting here. Hollywood activists Adrian Grenier and Peter Glatzer said Monday that they would open a pop-up art gallery and store for two weeks in a historic downtown Los Angeles building. The gallery will include more than 50 pieces by Los Angeles-based artists including Tierney Gearon, Jay Mark Johnson . . .
LA TIMES | Read article here.